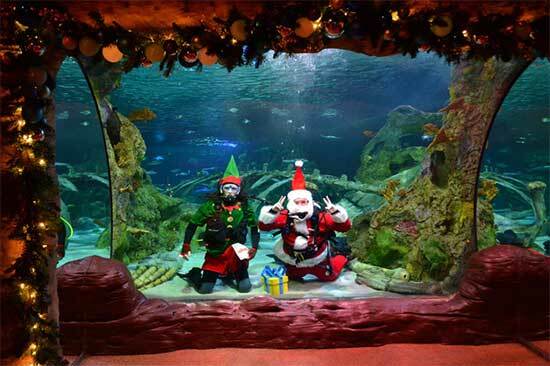 Scuba Diving Santa: Experience a dive show like no other with a jolly red-suited diver, beard and all, along with his elf as they take the plunge in a magical dive show amongst the fish, sharks and stingrays in SEA LIFE Grapevine’s 160,000-galloon ocean tank. Pose for pictures and find out if Scuba Diving Santa thinks you’ve been naughty or nice. Scheduled dives occur on December 13, 16, 20 and 23 at 11:30 a.m.
Holiday-Themed Animal Enrichment: The ocean tank will transform into a water wonderland on December 13, 16, 20 and 23 at 10:30 a.m. when special treats and enrichment gifts in the shape of decorative wreaths, gingerbread men and holiday trees are given to the turtles, stingrays and sharks. Stingray Ornament Bobbing: Watch stingrays get into the holiday spirit when they bob for tasty ornaments in Stingray Bay on December 12, 19 and 24 at 11 a.m.